People use tobacco in largely two different forms, SMOKING and SMOKELESS form. It has been now proven, that consumption of tobacco causes ill effects on general health as well as oral health in particular. Most forms of tobacco are used in mouth, for example, cigarette, bidi, gutkha, pan masala containing nicotine, khaini etc that has its harmful effects on teeth, tongue, gums and overall mouth. Pan masala or betel quid consists of tobacco, areca nuts and staked lime wrapped in a betel leaf, that is used in many parts of India. Apart from causing rough brown stains and tartar on teeth, it also causes bad breath. 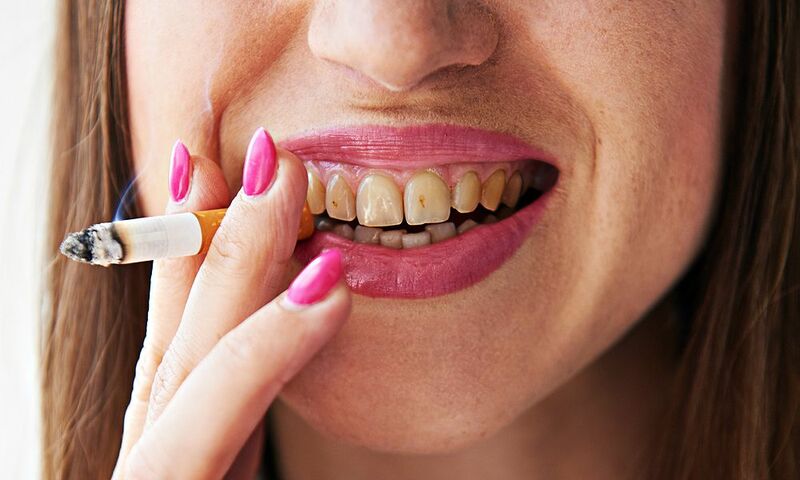 Regular use of tobacco leads to dental caries (demineralization causing cavity), periodontitis (disease of gums and underlying bone) and other adverse oral conditions. Tobacco is a known risk factor for oral pre cancer and cancer and congenital defects in children whose mother use tobacco during pregnancy. The World Health Organization (WHO) has time and again strengthened the work for effective control of tobacco use. At the World Health Assembly in May 2003, the Member States agreed on a groundbreaking public health treaty to control tobacco supply and consumption. The treaty covers tobacco taxation, smoking prevention and treatment, illicit trade, advertising, sponsorship and promotion, and product regulation. Oral health professionals at India are committed to advice their patients on the ill effects of tobacco usage and along with the Tobacco Intervention Initiative (TII) of Indian Dental Association, are always motivated in helping people quit tobacco, both for smoking and smokeless forms. As patients have to visit the Dental Surgeon for couple of appointments, it provides an opportunity for Dental Surgeon to effectively communicate the health issues related to tobacco use and through a structured program, help in quitting tobacco. The very first thing that a Dental Surgeon could do is to clean your teeth and gums by a procedure called Professional Scaling & Polishing, thereby relieving you of stains, calculus, bleeding gums and bad breath to a large extent. Apart from their role in clinical settings, Dental Surgeons also help in advocacy against tobacco use and its ill effects on general health. The community or school authorities could approach their neighborhood Dental Surgeons to help them out with advocacy on tobacco abuse or risk assessment of damages done by tobacco on oral health. We together could make our community a tobacco free community and help thousands get rid of the ill effects of tobacco use.